Tobacco Products Directive – what next and what can be done? Defective process. Most of the problems arise from the way this legislation was made – in a closed series of meetings (the ‘trilogue’ process) between October and December 2013. This meant completely new legislation was created in a secretive process without consultation, without proper impact assessment, no national parliamentary scrutiny, without adequate scientific input and without the normal procedures for making new legislation through the Ordinary Legislative Procedure. The trilogue is not supposed to be a forum for conjuring up legislation out of thin air – but for resolving differences of detail between the Council, Parliament and Commission. The European Ombudsman is finally making inquiries into the transparency of the trilogue process generally, but she’d already that ruled my complaint about this abusive legislative corner cutting was inadmissible in 2014. The snus ban is possibly the worst bit of negligent grandstanding legislation ever seen. However, the Directive did become law in May 2014 and has to be transcribed into national law by 20 May 2016. The directive is fixed. The TPD itself is fixed and became European law on 19 May 2014. This isn’t actually a law that is binding on citizens or businesses, but on member states (the 28 governments of EU), which are required to introduce domestic legislation to comply with the directive by 20 May 2016. Member state governments and national parliaments cannot change the directive, they can only deal with any options, flexibilities and ambiguities in the directive or in some cases go further than required. This is what the Department of Health consulted on over the summer. Given there was no consultation on the directive (Article 20) itself, I feel this exercise was a little patronising – but responded all the same with this: Lipstick on a Pig. For products already on the market at 20 May 2016. Manufacturers and importers have to bring the products into TPD compliance by 20 May 2017 and must complete the notification process before 20 November 2016. Note that a product becomes a ‘new product’ if it has to be changed to make it TPD compliant. For products to be placed on the market between 20 May 2016 and 19 November 2016. Manufacturers have to bring the products into TPD compliance by 20 May 2017 and complete the notification process on 20 May 2016. Yes, I did say on 20 May 2016 (see implementing regs s30). For products to placed on the market after 20 November 2016. The product must comply with the TPD at launch, and the notification will need to have been done 6 months prior to launch. So a product brought out in December 2016 for Xmas will need notification details entered in June 2016 and be fully TPD compliant at launch. By 20 May 2017, everything on the market should be fully TPD-compliant. Big computer, big headache. Each member state requires notification of new products – but the EU will have a single computer portal to help with notification. Notification information will be fed into a central European computer system and shared with all member states, starting on 20 May 2016, the day the system goes live. That’s the same day everyone wanting to put new products on the market between May 2016 and 19 November 2016 has to load up their notification data and transmit it seamlessly to the member states. Language translation – I’m sure that will just work. Big demand on an hurriedly constructed IT system on day one. Death by paperwork. Negligible effort has been expended to make any of this less bureaucratic – other than the high-risk idea of running it all on one big computer portal. It’s almost as if the costs and burdens are seen as a benefit – a bad habit transmitted from regulating tobacco companies, where bureaucrats couldn’t care less how expensive and wasteful the regulation is. So some manufacturers will potentially have to notify thousands of products, many that are almost entirely the same, into this computer system. See my comments on the notification regime: Death by paperwork: e-cigarette notification regime. What is all this for and what will be done with it? False – this has to go on products that are sold without nicotine, like most refillable devices, tanks or mods. Misleading – nicotine isn’t highly addictive or even addictive per se, it depends on how rapidly it is absorbed (its pharmacokinetics) – we know this from NRT studies. Perverse – ideally e-cigarette users will become non-smokers. This message is imploring dual use or continued smoking. Of course this is a ridiculous message, but it still has to be splashed over 30% of the packaging in bold black and white, adding to the perception that these products are harmful rather than vastly safer than cigarettes. The directive includes so-called ‘implementing acts’. These are details that the legislature leaves to the Commission to sort out – implementing detail rather than the big picture bureaucratic harassment that MEPs and Council ministers like to involve themselves in. The Commission lists these: Implementing the Tobacco Products Directive. For e-cigarettes, there are two implementing acts and one report in preparation – here is the status at 20 Sept 2015. I have seen nothing of the report on ‘potential health risks to public health from refillable electronic cigarettes’ or ‘technical standards for the refill mechanism’ – and have commented on the reporting format here. Note that the EUREST consortium includes an anti-smoking activist group with no relevant experience, ENSP, that has been hostile to e-cigarettes and harm reduction and advocates member states going beyond requirements the directive. The PRECISE consortium is more opaque. Gold plating. In the UK the Department of Health and devolved administrations will also have to finish regulations and add any gold-plating they want to include (for example, the Scots plan to ban all e-cigarette advertising even though this isn’t required by the directive). How can the TPD be changed? 1. By legal action that challenges the directive by showing that it violates European Union treaties or conventions – like a constitutional challenge. This is live right now, through the case brought by Totally Wicked – explained here Totally Wicked Challenge to Tobacco Products Directive and on the Totally Wicked dedicated Article20LegalChallenge website, where you can show your support for the case. The case will be heard on 1st October 2015 at the Court of Justice of the EU. Support this case!! Please show your support before 29 September – we need to communicate the broad base of support for the case and the deep concern about this useless legislation. On 29th September, Totally Wicked will be handing in the petition at Parliament – see New Nicotine Alliance call to arms. We don’t know when the court will actually issue a decision – hopefully before May 2016 – they are clearly trying to expedite it and will be hearing three TPD related cases in the same 2-day session. I think the TW case is very strong, but I also think the court acts politically, and may reflect individual preferences of the justices hearing the case. If the case is successful it will be important to have a clear view of what should take its place and press the authorities to take that approach and not some random knee-jerk reaction. Other cases? Note there may be other e-cigarette cases in future – especially if member states go beyond the directive or implement it improperly. However, they would need to work with whatever precedents were set in the Totally Wicked case. Snus ban? I think Swedish Match should man up and bring a case to against the snus ban… a subject I will return to. And yes, I realise it is unusual for public health advocates to call on tobacco companies to take legal action, but it follows logically from everything I have written on this site about snus – eg. this letter. 2. By the amendment of the directive. This would require a new directive to amend or withdraw parts of the TPD. The European Commission has the ‘power of legislative initiative‘ in the EU. This means new directives and amendments can only be done with a new Commission proposal and then by going through the same ‘ordinary legislative procedure‘ that was used to agree the TPD in 2013. The Commission is unlikely to want to do this, to put it mildly – though if the legal action is successful, or partly successful it may have no choice but to open it up – depending on what the court finds. Parliament (by a majority of its component Members) may ask the Commission to submit a proposal in cases where Parliament thinks EU legislation is needed to help implement the Treaties. If the Commission refuses to submit a proposal, it has to give an explanation. These are not especially promising routes. MEPs are still defending the useless legislation that they produced in 2013, with little sign of remorse or contrition. Member states are busy on the detailed implementation of the bad legislation they jointly produced. They would not want the bother of redoing it and undoing all their careful preparation. In fact, many are hard at work making it worse than it needs to be – so there is not much sign of good will at present. Update: if you want to grasp the hostility of the Commission and member states – look at the minutes of their May meeting (h/t Dodderer). A European Citizens Initiative, the European Free Vaping Initiative was tried in 2013/14 and gathered 181,000 signatures. Maybe a 2016/17 initiative would have more impact once the mess was more obvious? Alternatively, like many petitions, it could create the appearance of action, achieve nothing and deflect from more useful political activity. 3. By expediting the next update of the directive. This is really a variation on 2. above, as it still needs a Commission proposal and new legislative process. The key to this is Article 28 of the TPD, “report”. This has to be done ‘no later than five years from 20 May 2016‘ – so it could be done in say 2018, rather than wait for 2021, though the Commission absolutely will not do this without a lot of pressure or obvious failures of the directive. It is the trigger for updating the directive in the ordinary course of events. This process could be the focus of efforts to bring problems with the directive to the fore. One way of doing this will be the annual reporting under Article 20.7 of the TPD – the first of which is due in May 2018 to refer to the calendar year 2017, and the duty of the Secretary of State to monitor market developments. It would be good if industry associations could fund a ‘State of Vaping’ annual report with a 2015 baseline. Consumers could also work out a way to characterise the damage (or benefits) that the directive is causing. Can other things be changed? Anywhere a member state has gone beyond the minimum requirements of Article 20 or is otherwise ‘gold-plating’ then there is a case to resist through national parliaments and any ‘better regulation’ machinery there is in country. Although most of the details are settled in the TPD, I believe it is always worth responding to consultations on implementing detail – not least to put views on the record should there be future legal actions or other scrutiny of the actions of officials and ministers. Accountability. Build the simple proposition that the TPD Article 20 is the worst European regulation ever made, the inclusion of e-cigarettes in the TPD was a mistake, that Article 20 of the directive will cause harm without doing anything good (see here), that it was made in an opaque and unlawful process (see here) and everyone involved should [be ashamed][apologise][resign] delete as appropriate. This is about holding health ministries, politicians and regulators to account for the utter mess they have made – and getting them to play a more positive role (see here). That is the starting point for change and should be a period of intense activity from 1 Oct to 20 May 2016. Gold plating. Fight every excessive measure or wasteful gold plating that goes beyond the minimal interpretation of what the TPD requires. Scrutiny. 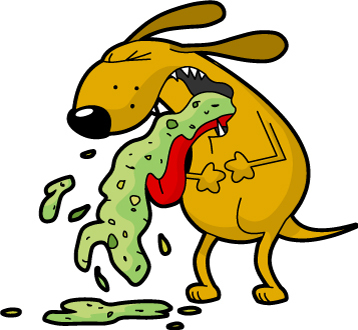 Encourage retrospective parliamentary scrutiny of the TPD – both the measures (useless and damaging) and the process (outrageously opaque). For England, I would like to see the Health Select Committee, Public Administration and Constitutional Affairs Committee and/or European Scrutiny Committee examine Article 20 and how it was made. A better alternative. Work on having defining a consensus alternative regulatory regime. Persuasion to change regulation will be more convincing if there is a well-designed alternative – possibly using the emerging BSI or CEN standards. Press to bring forward the report under Article 28.
Business and consumer monitoring. Document TPD impacts from both personal consumer or business perspective – consumers could keep a kind of diary or dedicate a forum to these impacts, businesses should carefully record impacts of the directive. An annual State of Vaping review. Challenge. Keep up the efforts to correct misleading reporting and commentary in the media and do not allow false information or assertions about the TPD to go unchallenged. Capacity. Widen and deepen advocacy networks – encourage circulation of information and analysis, and calls for action. Please let me have your suggestions in the comments and we can debate, refine and prioritise this list. I’m afraid the problem with EU directives is that they are very hard to undo – that is why they should be used sparingly, made with due regard for the EU treaties, and designed with great care and transparency – i.e. not in the shoddy way the TPD Article 20 was made. Is this the worst EU law ever made? 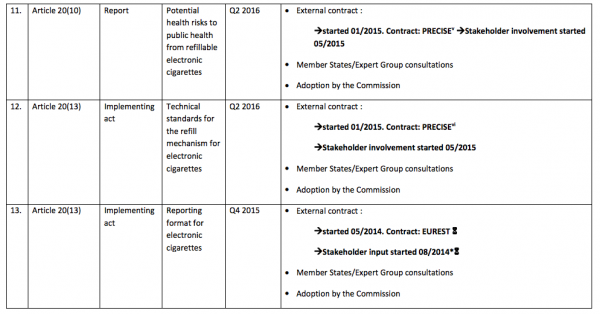 29 comments to Tobacco Products Directive – what next and what can be done? from just the UK. Not including the profits made from the big Pharma companies from the sale of cancer drugs. Why not ban the sale of Tobacco altogether? Ill give you 12.3 billion reasons. Ironically this ridiculous Law has been passed by Belgium. Belgium (the place we all used to visit for cheap cigarettes. We live under the delusion of democracy. Until we leave the EU I fear things will only get worse. I can’t believe I’ve only just learned of this pernicious legislation, after my vaping products supplier wrote to me saying they would no longer be able to sell the products I want after 20 May. Obviously, they’re encouraging me to stock up before that date, which I probably will do (on the hardware, at least). I’m a life-long smoker who’s been under (financial as well as health-related) pressure to give up, and discovered I very much enjoy using e-cigarettes almost as much as smoking (more in some ways). If vaping becomes dificult and expensive, I could easily end up taking the line of least resistance and going back to tobacco. No doubt the government will be pleased. In practice, since I mostly buy 1.8% products anyway, that particular limit (banning eliquids over 2%) won’t affect me that much, but as a libertarian, I strongly object on principle to government interference of this kind with my free autonomous choices as a consumer (subject to the usually accepted constraints). I can’t see the point of limiting suppliers to 10ml bottles (I usually buy in 30ml, 10ml is so fiddly and of course usually more expensive per ml), nor of limiting the size of tanks, just to make it more difficult for people to vape instead of smoke. In principle, I’ve been an unwavering supporter of European Union since I became politically active over 40 years ago; however, this EU bureaucracy-mad legislative body has long been a disaster. This latest piece of undemocratic legislation-for-the-sake-of-it is likely to be the last straw: I’m seriously considering, for the first time ever, voting to take the UK out of the EU, and hang the long-cherished ideal of European union. I’m seriously angry. Sorry, I omitted to leave my name and contact details when posting the above. I son’t wish to remain ananymous. What about online shops? they can still selling e liquids with nicotine? I heard that can’t be selling online, but what about e liquids without nicotine? these liquids also been banned ? I propose vapers affected by the upcoming legislation go out and find every survey they can find regarding tobacco use and indicate that they have gone back on cigarettes, which for a large majority will actually be the unfortunate truth. The sudden increase in cigarette use with either generate some motivation to discuss this issue again at least with a certain level of urgency. Or for those with a more bleak outlook on life it will confirm that the big TPD article 20 plan has worked and the tax revenue on tobacco has been secured again for a bit longer. Either way I believe it is the quickest way for the vaping public to unequivocally find out where the legislative bodies goals really lie. Clive, your report was full, short and precise. Well done. What will happen according my opinion is simple: The cost for the implementation of TPD in the market is very high. That makes obstacles for the survive of SME companies of ecig markets. Possibly, courts in national level will give the solution. Every legislation voted by parliaments can be judged in courts. Hope that justice (at least) will have job done. When the cost for each nicotine level of product exceeds 5000 euros, this amount can not be given from any company;only the giants will be able to do so. Several vital EU principles are down: Internal market, transparency, accessibility, health of citizens. The whole TPD thing is rather like being told you have a terminal disease. The only difference here is, that we have dates and the government might just let it happen.! I sadly fear that Article 20 will remain until it can be proven that it is/was hugely detrimental to Public Health. With UK adult smoking prevalence now at its lowest at 18.6% (due to 1.6 million non smoking vapers) there is every chance that this rate will decrease further prior to the onerous Article 20 provisions becoming reality. How will Government react if smoking rates start increasing post Article 20 because popular open systems become non compliant and the cost of continuing to vape by using Big T’s is equal to smoking tobacco resulting in vapers simply reverting back to tobacco? Is there an EU legal route that is similar to constructive dismissal in employment law whereby prior to Article 20 becoming law an essence of time case can be made that Article 20 will be detrimental to Public Health in that it will force current non smokers back to smoking? Any increase in smoking prevalence would then be proof that Article 20 rather than improve Public Health via reduced smoking prevalence has in fact forced more people back into tobacco smoking. If we expect the worse then perhaps we should be planning for the worse and using this for a future legal battle? Perhaps pressure needs to be placed on Govt outlining that Article 20 will cause smoking rates to increase. But then again, perhaps ultimately they simply don’t care and therein lies the real problem with Article 20 and the TPD. Protecting smoking and subsidising via tax revenue the 80% who don’t smoke is far more important than the 20% of smokers who will lose up to 10 years of their lives? All of the devices I use are threatened by the legislation, in size and the elusive “leak-free” measurement, which is ridiculously vague and unachievable. If filled improperly, anything can leak. When you think of all the potentially dangerous products in our lives that don’t have “leakproof” technology built in, it beggars belief that a 2% maximum concentration of nicotine liquid is considered such a hazard. I use 6ml tanks, which of course will be withdrawn from the market under the TPD. Will purchasing these products from outside the EU for personal use also be illegal? Or will we continue to be able to purchase our preferred hardware from China or elsewhere? I don’t doubt that a manufacturer will adapt current tanks to meet the TPD requirements if a whole continent is looking for a compliant version, but what to do until then, and what’s the point of new, compliant hardware if the juice restrictions push effective devices out of reach. The way it seems to me is that most existing vapers will be pushed towards breaking the law, or relapsing to smoking when they can’t source the ecigs they require to maintain a smoke-free life. As someone who makes their own eliquid (and have done since a week after buying my first effective kit), I’m still unsure as to what impact the TPD will have on the DIY market. Technically, nicotine concentrate is not discussed, only eliquid (as a prepared, blended product to be vaped directly). However, it seems highly unlikely that eliquid will be restricted in strength & quantity per unit yet concentrate remain available by the litre in 7.2% strength. If I purchased nicotine at 2% maximum (and who are we kidding, the maximum vendors will risk bottling will be 1.8%) and in 10ml quantities, a large proportion of my blends will be expensive nicotine base (rather than the cheap vegetable glycerine that currently makes up most of my liquid). Having to buy it in multiples of 10ml, it will eliminate the cost benefit of making our own juice. However, if forced to purchase pre-blended for all my needs, or pay a great deal more for my own, makes using my favoured tank impossible, as this uses low strength liquid in much higher volumes- so I’m forced into using less effective tanks to limit the amount of eliquid required (I am now considering using less effective tanks for nicotine and just using flavoured VG in subtanks, but this means separating the two appealing aspects of vaping into two separate actions). My other, very likely, option is to purchase all my required hardware and nicotine from outside the EU. I don’t have a problem doing this for hardware (I buy most tanks from China already), but I do have my concerns about buying nicotine concentrate from untrusted and unregulated sources. I currently buy it from trusted UK vendors that are subject to existing UK legislation. The bottom line is that the hobby vapers amongst us will probably get by through a combination of stocking up on threatened products in advance and working around the law (or directly breaking it if necessary), but the vast majority of vapers source what works for them locally and like a kit they can “plug & play”. If what they use is withdrawn, they won’t switch to international & black market sources, they will simply relapse to smoking. Equally, the current smokers out there who may have switched to vaping are unlikely to do so if effective products are unavailable to them on the legitimate market. Article 20 has to change, I can’t contemplate any other outcome, as the costs are too great. My fear is a prolonged period of prohibition before courts or common sense finally overturn this injust and harmful legislation. What will happen to foreigners who come over on business trips with non-compliant devices? Or does this only apply to sales? Interesting question, will customs ‘search bags’ ? And also, the State of New South Wales has recently introduced laws that only prohibit sales to minors , and use of e-cigs in cars when minors are present, will the UK customs be searching every small parcel that arrives from NSW? and my impression that most of the other MSs would prefer to increase ecig regulation,I fear the Commission may use the PRECISE report on “Risks for public health associated with refillable products” to justify medregs/full ban on these products. It would solve a lot of their problems and leave them applying Art 20 only to a few TI products.Their approach re snus is not a comforting precedent. I see a bunch of lawsuits but none from Reynolds American — aren’t they going to sue to keep labeling American Spirit organic on commercial speech grounds? The Government is in something of a cleft-stick with their own departments telling them to avoid over-regulating e-cigs and the TPD doing exactly that.If the MHRA proposals are what we expect do we get a meeting with the Government afterwards to put our case? If we can point out to them allthe negative effects Article 20 will impose they may be minded to take some sort of action.Considering that vaping and the science has moved on dramatically in the last 2 years perhaps we could pursuade them that the legislation should only apply to Gen 1 devices? Tom – cleft stick is right …. sadly, those mistakes are now in the past and irreversible. The directive is binding until knocked out in court or amended via a new proposal from the Commission. Clive – we are a very successful retailer of vaping products both online and through retail outlets, the trend/demand as you know has now moved very quickly to 2 Gen – 3 Gen products which under the TPD will effectively be banned. As Article 20 as we all know is badly drafted , unclear, unrealistic , out of date, misleading and a danger to society. Another angle is maybe to ignore it ! take on the regulators , find and expose loop holes in the directive , challenge the validity of the legislation, define what an electronic cigarette is. Let the regulators tell our customers that they cant buy a 5ml tank even if they use it without any nicotine is that an electronic cigarette as defined by the TPD. What powers do the regulators have if we breach the rules and continue to sell products that we know work and stop people from smoking, can they shut us down, fine us ? bring it on ! When customers actually realize whats happening, when we have to tell them that they can no longer buy the products that work for them , products that have changed their lives and opened up a whole new world. Tell them that the EU backed by big tobacco and big Pharma would rather you go back to smoking and kill yourselves. Then and only then will any pressure from the vaping community be applied to the government. Can member states take legal action against a european law or deviation from european rules or laws on process ? Yes they can. In fact, Poland is challenging the part of the directive that bans menthol flavoured cigarettes. A challenge from Germany overturned the 1998 version of the tobacco advertising directive. It is very unlikely that any member state will challenge Article 20, but you are right to flag it as a possibility. If Sweden or Finland were not so captured by anti-tobacco extremists one might hope they would challenge the snus ban. I’ve heard MEPs say that they have so much passing across their desks that they ‘do the best they can’. I suspect much of that best is chatting to their ‘friends’ and not taking the time to to verify the ‘friends’ credentials or statements. I’m being charitable of course, but understanding doesn’t bring foregiveness or acceptance. Perhaps they should do less and better – the latter wouldn’t be difficult. By applying the precautionary principle to the EU, we should leave; there is more evidence to support this than was applied during the TPD. Just reading this make me want to cry in anger, frustration and dispair. After watching the TPD process through the EU last year, nothing will convince me that we should remain in the EU. I am also very angry about our’s governments role in all of this, and how they have let us down. What a sorry state of affairs. Amazingly, this is the work of hundred of MEPs, large numbers of well-paid civil servants, earnest ministers and supposed experts – making dozens of trips to Brussels and Strasbourg. Yet all that brain power could only come up with this – and aggregation of things that no-one would oppose, with no regard for the consequences. Pretty obviously what Niskanen called the “budget maximizing bureaucrat” has been having a grand old time , no?